Jitka Nováková, a violinist, is one of the most respected artists in the Czech Republic. She grew up in an atmosphere full of music and was taught by her father Josef Novák, the director of the Art School in Mladá Boleslav and a violin teacher and noted musician himself. As a ten-year-old player, Jitka Nováková gave her first recital. Other recitals in various towns followed every year. She took part in nationwide international violin competitions and was always awarded high prizes. In 1972, she won the 1st prize and the title of an absolute winner in the Art School Nationwide Competition and the 2nd prize and the title of the prize-winner in The International Radio Competition of Concertino Praga. In 1973 she appeared as a soloist in Mozart´s Concerto in A with the Chamber Orchestra of Mladá Boleslav at the Youth Orchestras World Festival in England. In 1975 she was awarded the title of the prize-winner in the International Radio Competition of Concertino Praga for the second time. She also won the 1st prize with the title of an absolute winner and the prize-winner in The Kocian Violin Competition. In 1975, thanks to her extraordinary musical talent, she was accepted in the class of Professor Václav Snítil at The Academy of Music in Prague. Under his guidance, she polished up her exceptional abilities. At the same time, she also appeared in many concerts not only in her native country but also abroad. As a soloist, she performed in almost all Czechoslovak orchestral performances. She successfully graduated from the Academy of Music in 1979. Two years later, she achieved another excellent success, and was awarded 3rd prize in a strenuous International Violin Compettition with a great number of performers in Zagreb. Henryk Szeryng, a famous violin virtuoso, was the chair of the panel. In the same year she began working as a research assistant at the Academy of Music in Prague. The following year she studied at the Guildhall School of Music and Drama in London in a master class of Professor Yfrah Neaman. After her return home she continued her studies in art research and in 1985 she concluded her studies with a concert in Rudolfinum (Dvořák's Hall). This concert met with a very good response. As the prize-winner of the International Violin Competition in Zagreb she was invited to give solo concerts in Zagreb and Dubrovnik in 1982. 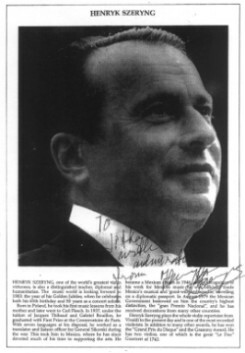 Henryk Szeryng the noted soloist and conductor heard her play and predicted that she would have a promising artistic future. Jitka Nováková often cooperates with other notable artists. She performed with her teacher Václav Snítil in Bach's Concerto in D for Two Violins. In Mozart's Concerto Symphony in E flat for Violin and Viola she gave performances with Josef Suk, with whom she also recorded Melody for Two Violins for the Supraphon record company. This composition was recorded on the occasion of the recording of the Suk's complete chamber work. Jitka Nováková very often plays in the family ensemble Tre Violini, with her husband Miroslav Vilímec, concertmaster of the Czech Philharmonic Orchestra and her son Libor Vilímec, a student of Academy of Music. In 1982 Jitka Nováková made her first recording (featuring Suk, Franck, Saint-Saens) for Panton and in 1987 she was awarded the Panton Golden Shield for a recording of French composers (Debussy, Ravel, Chausson) for the Artia Import Export Company. Josef Hála, a pianist, and the FOK Prague Philharmonic Orchestra under the conductor's baton of Jiří Bělohlávek, accompanied her. She also recorded Vivaldi's Four seasons for HLM Classics and Czech violin compositions for Jan Kubelík Society. She has also done several recordings for radio. At present she divides her time between her solo concerts and her part time job at the Conservatory in Prague. Mexican passport as a good will enjoy, he addresses his guests, whatever purpose of their visits is in French, English, Russian or Spanish. There are many of them. Christopher Eschenbach and Justus Franz, piano players, J. Depolo, the director of the Musical Festival, Vladimir Ashkenazy, a piano star, and many others – Maestro’s pupils Christopher Warren Green, concertmaster of the London Philharmonic Orchestra and Jitka Nováková, a young Czech violinist, to whom the Maestro prophesied promising artistic future. All of them came to him to Dubrovnik, hoping that he would devote some of his time helping them.